Glasgow Eye Infirmary School of Nursing badge, enamel and metal, c 1960s. The Glasgow Eye Infirmary was founded in 1824. In 1874 it moved into purpose built accommodation in the West End of Glasgow at Berkeley St which, by the late 1880s, had over 100 beds. The Infirmary continued to run an outpatients department in the East End. In 1945 the Spencer Research Committee was formed with capital of over £12,000, to oversee research in the GEI. In 1971 the entire in-patient accommodation at Berkeley St was destroyed by fire. From 1948 to 1974 the Glasgow Eye Infirmary was under the Board of Management for Glasgow Western (later Western and Gartnavel) Hospitals. In 1974 it was placed in the Western District of the Greater Glasgow Health Board and in 1993 it became the responsibility of the West Glasgow University NHS Trust. It was transferred to Gartnavel Hospital in 1998. 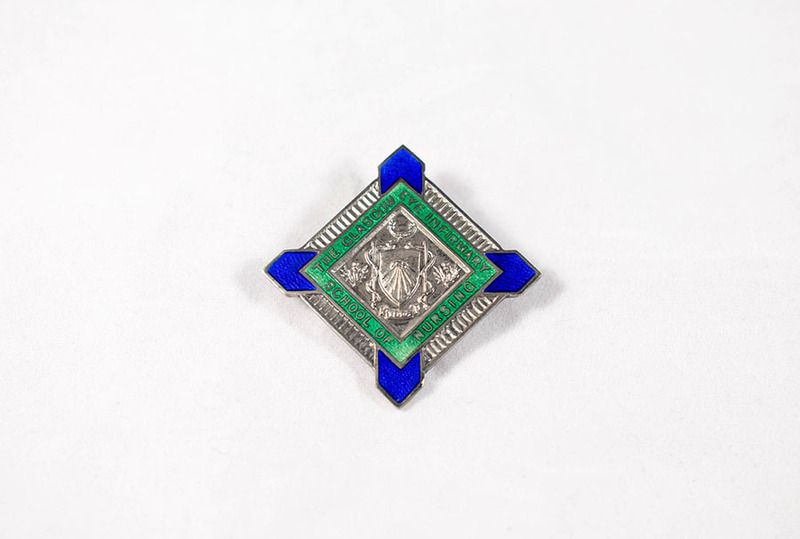 Unknown, “Glasgow Eye Infirmary School of Nursing Badge,” Heritage, accessed April 25, 2019, https://heritage.rcpsg.ac.uk/items/show/131. 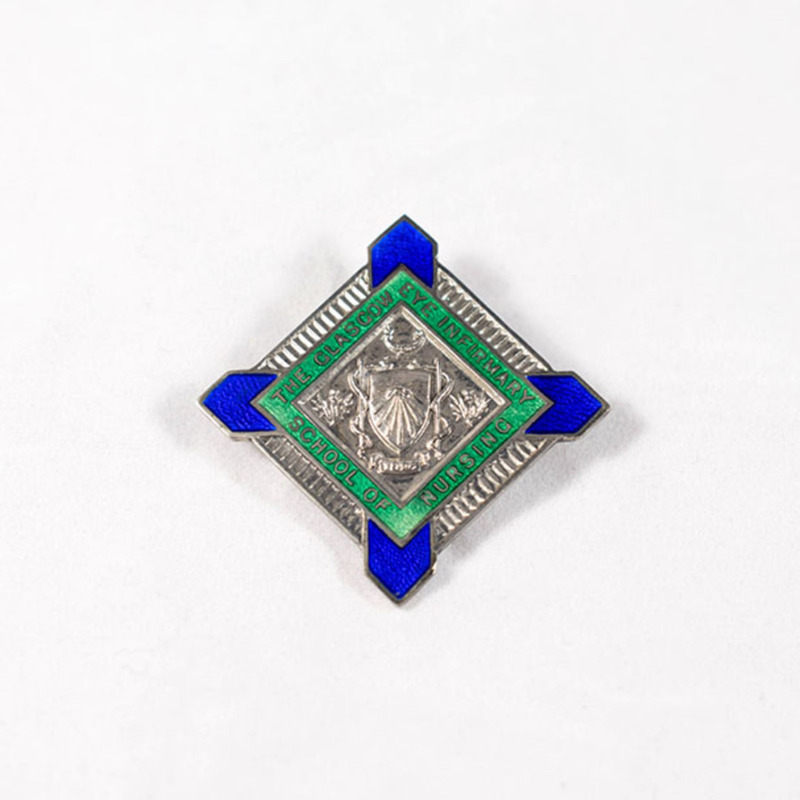 Description: Glasgow Eye Infirmary School of Nursing badge, enamel and metal, c 1960s. The Glasgow Eye Infirmary was founded in 1824. In 1874 it moved into purpose built accommodation in the West End of Glasgow at Berkeley St which, by the late 1880s, had over 100 beds. The Infirmary continued to run an outpatients department in the East End. In 1945 the Spencer Research Committee was formed with capital of over £12,000, to oversee research in the GEI. In 1971 the entire in-patient accommodation at Berkeley St was destroyed by fire. From 1948 to 1974 the Glasgow Eye Infirmary was under the Board of Management for Glasgow Western (later Western and Gartnavel) Hospitals. In 1974 it was placed in the Western District of the Greater Glasgow Health Board and in 1993 it became the responsibility of the West Glasgow University NHS Trust. It was transferred to Gartnavel Hospital in 1998.